Fatima, Portugal, Apr 21, 2017 / 03:02 am (CNA/EWTN News).- The canonization of Fatima visionaries Francisco and Jacinta Marto has been hailed as an exciting moment for the Church, but the rector of the Marian shrine has said that it bears an even greater significance in terms of putting a spotlight on Our Lady's message. “I think the canonization in a certain way helps to give credibility to the apparitions and to the message of Fatima,” Fr. Carlos Cabecinhas told CNA. Mary appeared to Francisco, Jacinta and their cousin Lucia May 13, 1917, for the first time, asking them to pray the rosary and make sacrifices for the conversion of sinners, which they did with decisive commitment. 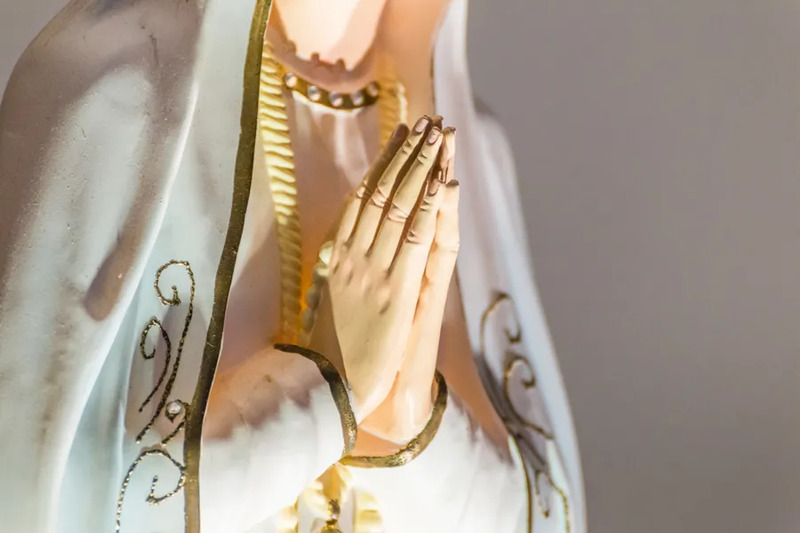 Our Lady continued to appear to them on the 13th of each month until October of that year, making constant appeals for an increase in faith, hope, conversion and prayers for peace. In addition, she also revealed to the children three “secrets,” which are now known to be a vision of hell interpreted as scenes from World War II, the rise and fall of Soviet Communism, and what was a foreshadowing of the 1981 assassination attempt on St. John Paul II. After the apparitions, Francisco and Jacinta Marto died in 1918 after a serious bout of the Spanish flu at 9 and 11, but were known to pray often and offered up daily sacrifices for the conversion of sinners and an increase in love for God. Fr. Cabecinhas has been the rector of the Fatima Marian Shrine since 2011, and is in charge of the bulk of preparations for the Pope's May 12-13 visit. He said the centenary of the apparitions, the canonization and the growing anticipation of Pope Francis' visit “is a moment of great joy” for the people of Portugal, but also for him personally. “For me it has been a great gift of God to be able to live this moment before the shrine and to have in my hands the decisions of the Shrine. It's a gift of God, but also a great responsibility,” he said, explaining that they are in the midst of making final preparations. In general, preparations are going “very well,” he said, noting that all of the big decisions have been made and things are falling into place, so it’s down to the final, last-minute work of getting ready to host an estimated 500-800,000 pilgrims during the May celebrations. Cabecinhas said that when pilgrims speak to him about their experience visiting the shrine, many of them comment on how silent and prayerful the environment is, which is something he hopes each person who comes is able to experience. The shrine has also been a popular place for Popes to visit, with Bl. Paul VI being the first pontiff to do so in 1967. St. John Paul II followed suit in 1982, making a trip that was largely intended to pay homage to Our Lady of Fatima, whom he credited with saving his life when he was shot May 13, 1981. Benedict XVI also visited the Fatima shrine in 2010, continuing the papal tradition of traveling to the holy site, and cementing even further it’s link to the Pope. Fr. 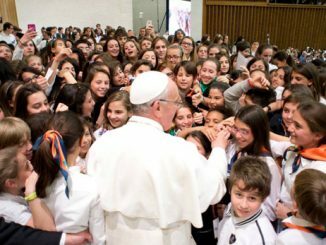 Cabecinhas said he believes Popes come to Fatima so often is because it has “a universal message, a message for the entire Church,” which is something each one of them have understood. With an entire year of celebrations extending beyond just the May celebrations, Cabecinhas said he hopes those who come even after Pope Francis' visit get to experience and understand Our Lady’s message on a deeper level. Muenster, Germany, May 14, 2018 / 02:28 pm (CNA/EWTN News).- The unresolved debate over a proposal to allow Protestant spouses of Catholics to receive communion in German dioceses under some limited circumstances has gathered steam after the country’s president waded into the debate at the major national Catholic conference in the town of Münster. The planned proposal has been championed by Cardinal Reinhard Marx of Munich and Freising, president of the German bishops’ conference, who announced in February that the conference would publish a pastoral handout for married couples that allows Protestant spouses of Catholics “in individual cases” and “under certain conditions” to receive Holy Communion, provided they “affirm the Catholic faith in the Eucharist”. Subsequently, seven German bishops, led by Cardinal Rainer Woelki of Cologne, ask the Congregation for the Doctrine of the Faith for clarification, asking whether the question of Holy Communion for Protestant spouses in interdenominational marriages can be decided on the level of a national bishops’ conference, or if rather, “a decision of the Universal Church” is required in the matter. Speaking in an interview with EWTN this week, Cardinal Woelki reaffirmed his position, calling for all parties to “consider and recognize that the Eucharist is ordered to the unity of the creed”. The Katholikentag event drew several tens of thousands of Catholics from German-speaking Europe to Münster May 9-11, and saw not only politicians and Cardinals Marx and Woelki restating and clarifying their respective positions, but provided a stage to Germany’s president, Frank-Walter Steinmeier, saying, in the keynote speech that opened the event: “Let us seek ways of expressing the common Christian faith by sharing in the Last Supper and Communion. I am sure: Thousands of Christians in interdenominational marriages are hoping for this”. 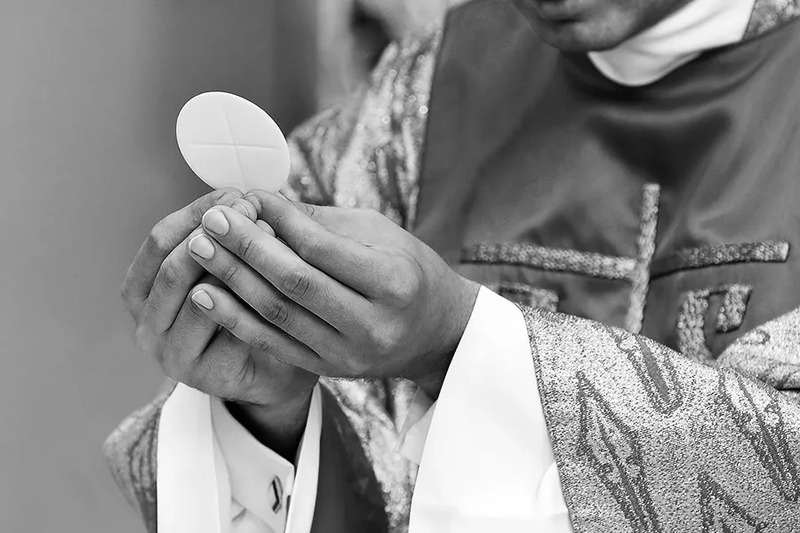 A peculiarly polemical form of this “hunger” caused something of a public scandal shortly after, when an official panel discussion played host to one celebrity’s demand to be “handed that wafer [the Most Blessed Sacrament]” since he pays for it with his Church tax. Speaking on stage with Cardinal Woelki, the comedian and TV personality Eckart von Hirschhausen sharply criticised the Catholic Church’s teaching – to applause from the predominantly Catholic audience – saying, “I don’t see the point of a public debate about wafers” since climate change, on his view, was a “far more serious” issue. Since he, as a Protestant spouse to a Catholic, pays Church tax and thus considered himself “a major sponsor”, the Church had “better happily hand out a wafer for it, or give me back my money!”, demanded von Hirschhausen, to an applauding crowd. The crowd’s mood notwithstanding, Cardinal Woelki politely but firmly disagreed. “As a Catholic, I would never speak of a wafer. Using this concept alone demonstrates that we have a very different understanding” of what the Archbishop of Cologne then reminded the audience “is the Most Blessed Sacrament”, in which “Catholics encounter Christ Himself”. With CNA’s German edition, CNA Deutsch, covering the diatribe, Catholics on social media quickly reacted with outrage to Hirschhausen’s pronouncements, triggering an apology on the following day, which in turn was widely discussed. At the same time, the Archbishop of Cologne said, “it is of vital importance for us to recognize that whoever says ‘yes’ to the real presence of Christ in the Eucharist, acknowledging that Christ is indeed really present, thereby naturally also says ‘yes’ to the Papacy, and the hierarchical structure of the Church, and the veneration of the saints and much, much more”. Just before these latest developments, on May 3, seven German bishops attended an inconclusive meeting at the Vatican to discuss prospective guidelines allowing non-Catholic spouses of Catholics to receive the Eucharist in certain “limited circumstances”, with the Vatican sending the Germans back, saying Pope Francis wants the bishops to come to an agreement among themselves. Genoa, Italy, May 27, 2017 / 09:54 am (CNA/EWTN News).- Pope Francis celebrated Mass for the feast of the Ascension in Genoa Saturday, telling faithful that Jesus never leaves us alone and is constantly praying and interceding for us to the Father.